URBED were commissioned by Siglion, a joint venture between Carillion and Sunderland City Council managed by leading property experts Igloo regeneration, to produce a masterplan for the former Vaux Brewery site in early 2015. The masterplan was initially developed as part of igloo and Carillion's bid for the project back in 2014. It has since been updated following a series of consultation events, to engage with local people and businesses on their aspiration for the site and to provide the framework for an ambitious scheme which enhances this part of the city centre and links it with the newly created Keel Square. URBED worked closely with a multi-disciplinary team to bring the planning application together, including Planners and Engineers- Cundall, Architects for the first phase building- Fielden Clegg Bradley Studios and Landscape Architects- Landscape Projects. 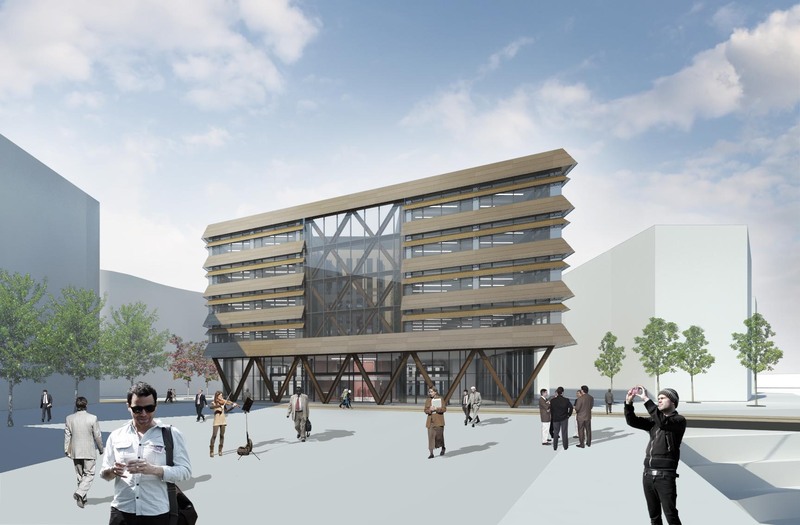 For this key city centre site, the proposals were to deliver high quality office accommodation together with complimentary residential, retail, food and drink, hotel and leisure uses – all linked to the city centre via the new Keel Square. Activity would be promoted through active uses on the ground floor of buildings to include cafes, restaurants and bars. 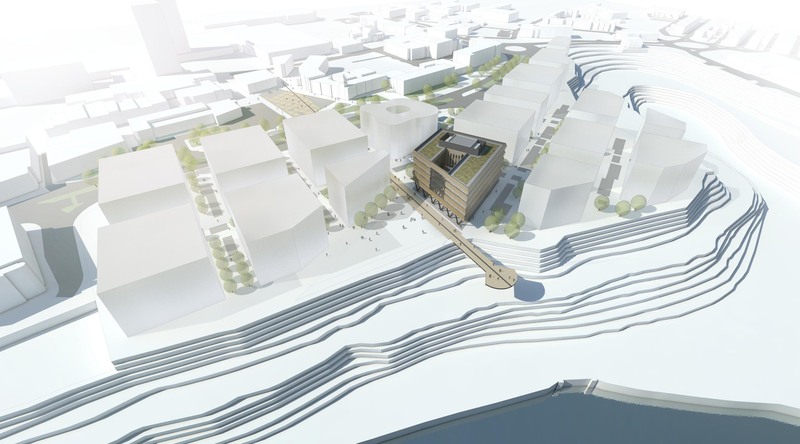 The development would also make the most of its clifftop location with public links to the riverside area, a continuous path along the cliff-edge and buildings orientated to make the most of views to the river gorge and out to the sea. A public realm strategy was produced by Landscape Projects to define the landscaping works for different street typologies and the new public spaces to be created, in order to provide a green and pedestrian friendly environment for all to enjoy. Siglion were successful in securing funding for the first office building on the site, which would set the precedent for future development on the site, and called in Award Winning Architects Fielden Clegg Bradley Studios to design the building. Outline appplication for the whole site, setting out the mix of uses, building line, building heights and public realm strategy. Detailed application for the first building on the site and the Phase 1 infrastructure works package. URBED's role was to produce a masterplan for the site to guide future development, and the illustrative masterplan is explained in detail in the Design and Access Statement. A document called the Masterplan Framework was also produced to fix certain paramaters which had been designed into the masterplan, to ensure it would be built out as intended, and these inlclude fixing the building line, heights, roads and land uses. A Statement of Community Involvement was also produced to document the consultation process, and included responses to a workshop and two exhibitions which were held between July and September 2015. 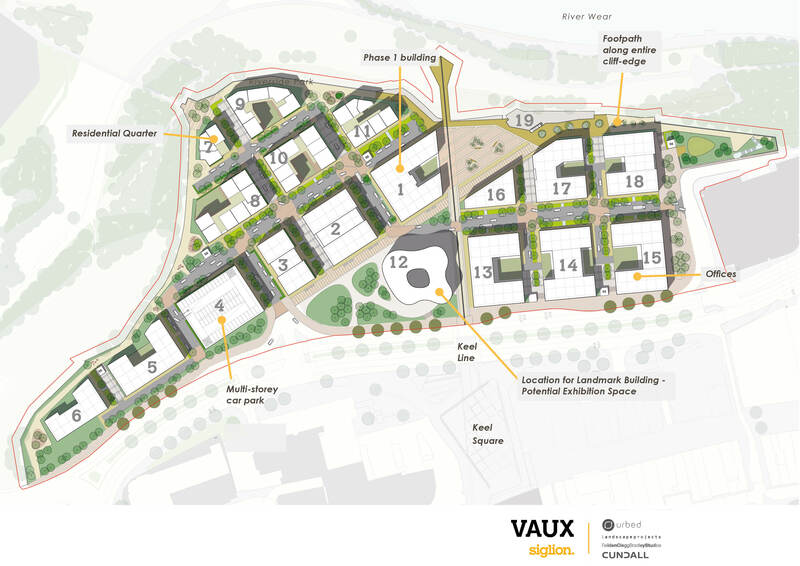 We were excited to be part of Cariliion and igloo Regenerations consortium which was named as preferred bidder in late 2014 by Sunderland City Council to develop the Vaux Brewery site over the next 20-years. John Tatham, partnerships director of Igloo Regeneration said he hoped the joint venture with the council would lead to a ‘step-change in the Sunderland economy’. He said: ‘[We] believe that good design combined with a deep understanding of a place creates developments where people want to be. This in turn translates into demand for property, better values, successful businesses and ultimately successful, viable developments leading to economic growth. Councillor Paul Watson, leader of Sunderland City Council said:’This decision marks an important milestone in the joint venture agreement which will breathe new life into under-used publicly owned land in prime sites for development. The team are in the process of pulling together a planning application for the Vaux site, which is due to be submitted in the coming weeks. This will be a hybrid application consisting of an outline application for the whole site, and a detailed application for phase 1 of the scheme, to include details for the first building and infrastructure works on the site. This information has been used to inform the development of the masterplan and the first building where possible. Full details of the consultation process and feedback from each event will be included in the Statement of Community Involvement, which will be submitted as part of the planning application. We would like to thank all those who made it to our exhibitions and took the time to fill out a questionnaire. The key findings from the latest exhibition held in September have been provided below, alongside our response. The feedback once again highlighted the desire for a large events and exhibition space, which have been illustrated as possible within the masterplan in the central building. We still received comments regarding the height of the buildings. Some of these comments focused on the skyline which could have been a result of the way the drawings were presented. As the application is outline – the simple square shaped buildings aim to get planning permission for maximum amounts – so as individual buildings come forward – their different design should contribute to a varied skyline. There was also a perception that height and ambition were mutually exclusive. We were keen to make a scheme which worked from the ground up, where people would be experiencing the site. We hoped then that the masterplan would set the stage for ambitious and interesting schemes to come forward as the site was put out to investors. Comments regarding the bridge over the Wear were still common, although this was mentioned less times than in the previous questionnaire. Whilst we made it clear a pedestrian bridge would not be provided as part of our scheme, the masterplan was designed to accommodate a bridge should one become viable in the future. The new bridge could also connect to a number of avenues on the site. A number of comments highlighted the desire to reflect the areas shipbuilding history and the sites historic use as a Brewery. We think this is a very important aspect and would recommend the sites heritage is incorporated into the street names when they are designed. We have also designed the Phase 1 building with materials which we feel reflect the industrial heritage of the site. Vaux September Exhibition - Tell us what you think! Once you have had a look, please fill out an online survey form here to provide us with your comments and feedback. Vaux August Exhibition: Tell Us What You Think! In July we invited local businesses, community groups and stakeholders to attend a roundtable exhibition to discuss our emerging proposals for the Vaux Site. The aim of the workshop was to get local perspectives on the use of the site and make sure our masterplan was on the right track before wider public engagement. Most groups mentioned the importance of offering something on the scheme which would attract people in (such as independent restaurants and bars and open air events) but also attract people into the city centre itself - such as apartments and employment space. There was apprehension from all groups that the scheme would take too long to deliver or would not happen - based on previous proposals for the site and the length of time it has been vacant. Concerns were also raised about demand not being met resulting in vacant units on the site or in other areas of the city. General consensus that the project was very important for creating a more positive perception towards Sunderland. In promoting the image of Sunderland as a great place - many groups mentioned the importance of having something on site for the Tall Ships Festival in 2018. All groups were keen to see ground floor retail and leisure units as well as a hotel. Most groups mentioned the aspiration to provide open-air events space within the scheme such as space for food and drink festivals. Need for high quality public space which is vibrant and interesting. Need for spaces which are used both throughout the day and night.